Fri., Oct. 28, 2016, 4:50 a.m.
Every Wednesday morning via teleconference, the football coaches of the Big Sky Conference entertain questions from the media about their upcoming game. 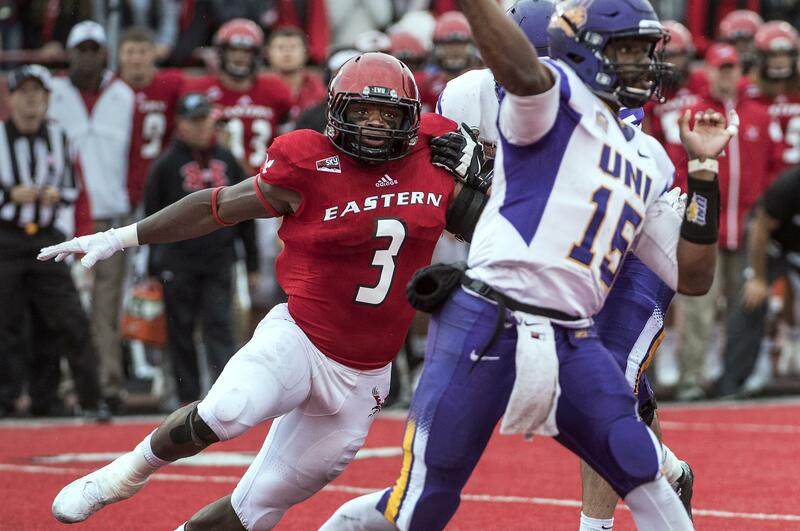 When the subject turns to the Eastern Washington defense and what catches their eye, opposing coaches offer the same response. That would be Eagle defensive end Samson Ebukam, a force on the edge since his true freshman year in 2013. “He’s a game-changer, and you have to account for him,” said Montana State coach Jeff Choate, whose words apparently went unheeded as Ebukam forced two turnovers and otherwise dominated the Bobcats in a 41-17 Eastern win last weekend in Bozeman. Now a senior, Ebukam is one of the top defensive ends in the Big Sky Conference, and his speed and athleticism are drawing interest from NFL scouts. A year from now he hopes to be playing professionally. That’s Ebukam’s dream, and it has nothing do with fame and glory. He’s passionate about “playing free” on defense even as he tries to make prisoner of the opposing quarterback. “I love football, and it would be good for my family to get some money, so that the sacrifices they made were worth it,” Ebukam said. The sacrifices were many, and have lasted all of Ebukam’s life. Perhaps Ebukam thrives in space because he had so little as a child. One of seven children, he grew up in Nigeria, which is slightly larger than Texas but holds 188 million people. It holds them uncomfortably. Ebukam, who lived there until age nine, recalls the overcrowded markets in his home town. The schools were even worse, though he didn’t know it yet. But his father knew. Tobias Ebukam, a businessman, had seen enough of the United States to seek a better life for his family – whatever the cost. Settling in Portland, he scrimped and brought the rest of his family across the Atlantic child by child, a heart-wrenching project that lasted eight years. When Samson was six, his three older siblings departed for America. Three years later, Samson and the younger children made their way west – without their mother, Stella, because there wasn’t enough money. Even while Stella lived half a world away, “She was the glue that was holding it all together,” said Ebukam, who leaned on his mother via cell phone during the tough times in Oregon. There were many. Smart enough to be bumped up a grade in Nigeria, he was pushed back down in America because he didn’t speak English. His first four months in Portland were spent in front of a television. “I was watching movies, trying to repeat what they said,” said Ebukam, whose favorite flick was “Friday After Next.” He bought or borrowed any CD he could find, trying to catch up. Meanwhile, the schoolyard bullying followed him from Nigeria. Scrawny when he left his homeland, he appeared even more vulnerable to American kids. “I was in a lot of fights,” Ebukam recalled. The bullying stopped in the eighth grade, thanks to a growth spurt that also opened up the world of sports. Until then, “football” was the game they played back in Nigeria, 11-a-side kicking a ball. Ebukam played soccer with more abandon than grace, racking up so many red cards that he was invited to try American football. By the end of his career, he’d played most positions on offense and special teams: running back, fullback, tight end and returned punts and kickoffs. On defense he was a natural at end “because I could play free and not worry about the rules and be more physical,” he said. At David Douglas High, he was a state runner-up in the shot put and javelin, but flew under the football recruiting radar. Eastern coaches spotted him at a summer camp, offering him a scholarship. “We felt like we maybe got a little bit of a steal in recruiting, “because he was one of those guys who could have gone to a higher level,” EWU coach Beau Baldwin said. Ebukam’s only other offer came from Portland State. “But when I came here for a visit, I said there’s no way I’m going to PSU,” Ebukam said with a smile. More adjustments followed. On move-in day in the fall of 2013, fellow freshman Andre Lino was greeted by the sight of his roommate Ebukam covering every square inch of their room with his belongings. Now seniors and starters on the D-line, Ebukam and Lino still share a home. “He’s a good guy and a great friend,” Lino said. Ebukam got the fans’ attention midway through the 2013 season. Southern Utah was backed up near its own goal line early in a scoreless game when the quarterback threw downfield. Ebukam, who had already dropped back into coverage, intercepted the ball and returned it for a 21-yard touchdown. Ebukam ended that season as a second-team freshman All-America after playing in all 15 games. He’s been a second-team all-Big Sky Conference pick the last two years and came into his senior season with 14 ½ career sacks. Even more impressive, the kid from Nigeria who grew up speaking the Igbo language is a three-time member of the Big Sky All-Academic team. “He’s become that difference-maker because of the extra things he does,” Baldwin said. Ebukam has elevated his stock further this year; he’s a team captain and he’s up to 16 ½ career sacks, two short of a spot on the EWU career top 10 list. Published: Oct. 28, 2016, 4:50 a.m.